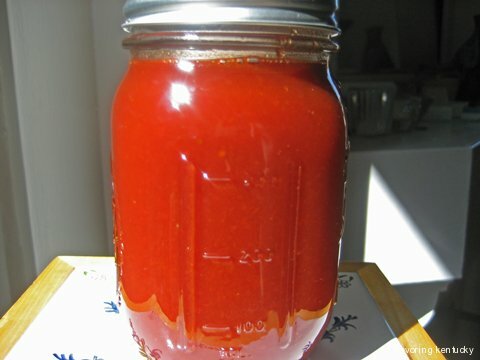 One more ketchup thought: What if I wanted to make and sell it commercially? I don't, but Mark Sievers and Carol Spence have good news for anyone who wants to use Kentucky ingredients to make "value-added" foods to sell to individual consumers, institutions, and restaurants. Sievers and Spence reported recently in Business Lexington that the University of Kentucky has launched a new Food Systems Innovation Center. The promise of this new Center is that dedicated (and capitalized) people can get sophisticated assistance in moving a food idea from notion to profit. Interested? Check it out. You and your idea may be the next Nancy's Fancy Cheddar Snaps. The world is coming to visit central Kentucky this year for the Alltech FEI World Equestrian Games. To help our visitors know more about Kentucky's food and food ways, Savoring Kentucky is rolling out 116 Savory Kentucky Bites, one for each of the 100 days before WEG begins, and 16 for the days during WEG, September 25 - October 10. Today's Savory Bite is number 81. They Make Hardwood Look Easy - and Delicious!